The London Eye elbowed its way onto the capital's tourist scene as one of the statement pieces to mark the turn of the century (see also The Millennium Bridge) and quickly became a definitive part of the London experience. 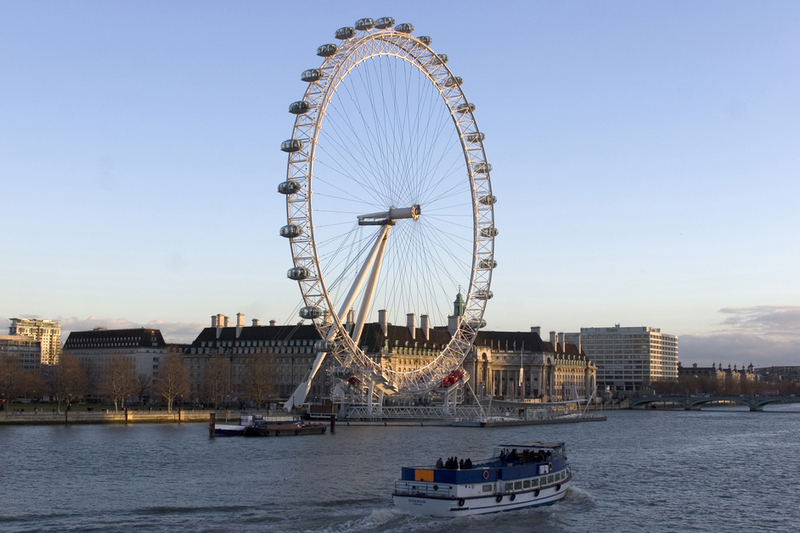 This spectacularly streamlined riverside wheel stands an impressive 135 meters tall and its sleek, modern, totally see-through glass-pods offer an unrivalled 360-degree view of London and beyond. The Houses of Parliament, Canary Wharf, Big Ben, the glorious Thames and Windsor Castle are just a few of the 55-odd attractions that can be admired from the top of the arc. On a clear day the view extends to 25 miles in each direction. It moves at a slow but steady pace, taking 30 minutes to complete its flight. The flight only lasts 30 minutes and it's bound to be busy but this is still top of the London must-do list. Please Note: Because of its popularity, there can be lengthy queues to board the flight especially during peak season. If you want to beat the queues you can choose to upgrade to a Fast Track ticket, which entitles you to check in just 15 minutes before your flight. You will see many of famous landmarks such as Big Ben, Buckingham Palace, St Paul s Cathedral, Westminster Abbey and Trafalgar Square. Plan the perfect year in the capital with our pick of the best events in London 2014. From January to December, every month boasts an impressive line-up of entertainment. So take a look at our guide and be sure not to miss a thing. From cheap budget hotels to luxury 5 star suites see our deals for London Eye hotels, including Corinthia Hotel London from 97% off.